The various iterations of the Angry Birds games have gotten more popular than anyone could have predicted. 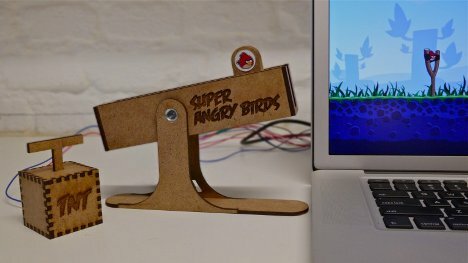 The game that involves launching birds to knock down structures and squish evil pigs has inspired all kinds of sequels, toys and other merchandise. But this slingshot controller made by a couple of hackers could be the neatest AB-related accessory ever invented. 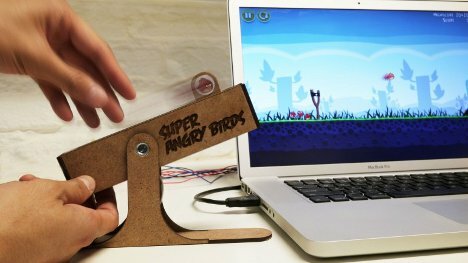 Using a motorized fader from an audio mixer, Hideaki Matsui and Andrew Spitz built the controller that they call “Super Angry Birds.” It has force feedback to make it feel like an actual slingshot being pulled back and it tilts to allow for different trajectories. When you’re shooting with the birds who have special abilities, the attached TNT plunger controller activates them. The finished controller makes the game controls more intuitive and natural-feeling than the standard touchscreen controls. Unfortunately, it doesn’t seem like the creators are ready to start marketing the ultra-cool controller anytime soon – this was a one-off fun project.